This stainless steel Gold Medal Steamin' Demon hot dog steamer is built to go the distance when it comes to durability. With no painted parts, and a full stainless cabinet and lid, this convenient steamer can hold up to 90 regular hot dogs and 40 buns. This hot dog steamer comes with an easy-to-clean 6-quart water pan and a juice tray to keep drips off the heating element. 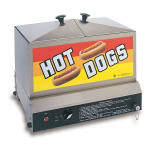 This Gold Medal Steamin' Demon Hot Dog Steamer uses the power of steam to help create hot dogs that are plump, juicy and ready to serve to your customers.